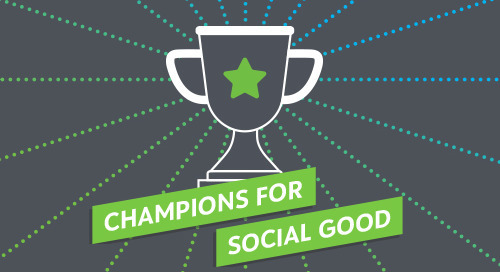 In this episode of the Champions for Social Good podcast, Rachel Hutchisson (@RachelHutchssn), vice president of Corporate Citizenship and Philanthropy at Blackbaud (@blackbaud), speaks with Jenny Lawson (@JenDenLawson), president of Networks at Points of Light (@PointsofLight), about trends in corporate engagement. Points of Light is the world’s largest organization dedicated to volunteer service, mobilizing millions of people to take action to change the world including working with their corporate members to activate their employee bases around the world. Jenny discusses three top trends influencing corporate engagement including disaster response, the changing world of work, and corporate involvement in moving social issues. She suggests that as companies become more global, through customer base, supply chain, or even employee footprint, the probability of a natural or man-made disaster affecting employees increases, making disaster response more routine, if not expected. Jenny also describes how the workforce is evolving and how this evolution affects how corporations design volunteer opportunities to engage employees in their purpose agendas. Lastly, Jenny and Rachel discuss how companies are finding that having an authentic social voice has value and is an important part of their brand image, leading to corporations more directly engage their employees in taking action on social issues. After listening to the episode, check out Jenny's article on npENGAGE to read about three additional corporate engagement trends: 6 Trends Shaping Corporate Engagement Today.